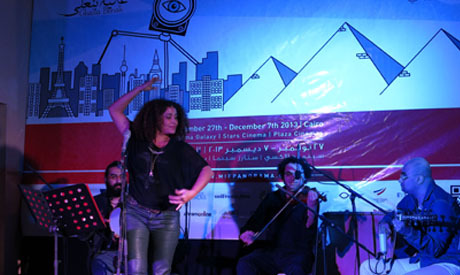 On the 7 December closing ceremony of the 6th Panorama of the European Film at the Plaza Cinema, Villa 69 and Young and Beautiful were screened while Ghalia Benali's live music enchanted the audience at an open reception between the shows. Ayten Amin’s drama, Villa 69, which debuted at the Abu Dhabi Film Festival, returned home with the Special Jury Award in the Arab World category. The film was screened three times during the panorama, after tickets sold out early on the first day and another screening was arranged to accommodate the ardent audience. Villa 69 can be seen in Egyptian cinemas starting 25 December. In contrast to Villa 69’s subject matter, but similar in its introspection, is French film Jeune et Jolie, the last screening of this year's Panorama. Questions of identity and sexuality in adolescence are treated in director François Ozon’s portrait of a ‘young and beautiful’ teenager. The film was nominated at this year’s Cannes Film Festival for the Palme d'Or, the highest prize awarded to the best feature film. Between films, on the 2nd floor terrace, Tunisian singer Ghalia Benali once again charmed her Egyptian audience with a performance fusing elements of Arabic classical music with jazz and Indian tunes. Benali, who has sung around the world, said "A foreign audience makes me hear the song as if for the first time. The Arab audience knows the words before they escape my lips, they enrich my singing," adding that both experiences contained "magic." The international singer observed that youth in Egypt are intellectual, passionate, creative and curious. "It [the Panorama] is a great initiative that brings a glimpse of the world to them, as many people find it difficult to travel," Benali commented. Prior to Benali’s performance, Villa 69’s audience member Nancy Eid, in her late twenties, said she enjoyed the film because it was both different and pertinent. “I know that many young people worked on it, so it’s fresh and relevant,” Eid said, also expressing her disappointment at the festival's brevity, which makes attendance challenging for holders of day jobs. Khaled Abul-Naga, who acted in the film, also highlighted that many of its cast and crew were first timers. “It was a bold move, but a necessary risk,” he asserted. The actor suggested that next year’s Panorama include a people’s choice award, where the attending audience can vote for their favourite film. Manar Mohsen, legal advisor at the Africa and Middle East Refugee Assistance, celebrated the Panorama as a great effort, and an event she looks forward to attending every year. She regrettably noted that many of the films were somewhat outdated. "I would have liked to see more recent productions, films that I can’t download myself," she said. Festival organiser Marianne Khoury announced that Misr International Film’s new initiative, Zawya (Perspective) – which will act as an extension of the Panorama – is set to launch in January 2014.Through Zawya, selected European films will be screening in Egypt throughout the year, first in two film theatres, set to expand later. As Egypt's first alternative and art house cinema, Zawya is a step within an ongoing process aspiring to alter viewership trends and film culture in Egypt. Zawya offers film enthusiasts a palette of options from world cinema, steering away from the Hollywood blockbuster template the Egyptian audience is limited to. “We will start with a Zawya in Sheikh Zayed, and another in Odeon,” announced Khoury, whose ambition is to have a Zawya in every corner, spreading across Egypt’s cities. This review was previously published during the 6th edition of Panorama of the European Film.